The album, owned by the Historical Society of Whitehall, helps us understand more about John Henry's life. In the half-century after the Civil War, small numbers of hard-working African-Americans made their way northward and became citizens, not just of the big cities but of small Northern towns. John Henry of Whitehall was such a man. Through the Baltimore family’s remarkable photo album, owned by the Historical Society of Whitehall in Washington County, we can get to know Henry and his children. The Civil War ended John Henry’s slavery in the South and gave him a way north through Union Cavalry officer Lt. William Boyd of Whitehall. A local legend has John Henry entering Whitehall astride a white horse announcing the return of Lt. Boyd, son of the local congressman, an escapee of a southern prisoner-of-war camp and liberator of slaves. John Henry did well in his newfound freedom and life in northern New York. 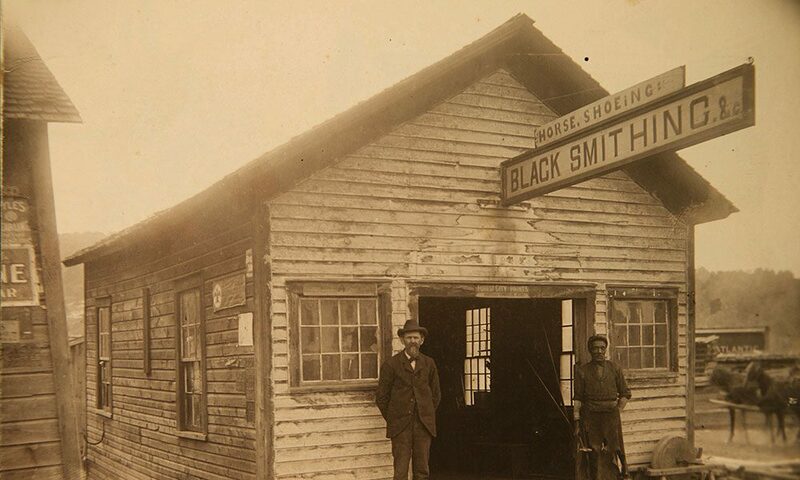 He opened a blacksmith shop and at times had as many as five employees. He associated with another industrious black resident of Whitehall, George Baltimore, “cloth scourer.” Baltimore had never been a slave although his father, Samuel, had been. Samuel was a veteran of the Revolutionary War and, like many black soldiers of that conflict, was promised his freedom in exchange for his service. His owner reneged on this promise of liberty, forcing Samuel Baltimore to free himself. He fled north to Troy where he supported himself as a barber. Barbering was only the beginning. Samuel Baltimore was a hard-working man, investing his time and talent in other businesses as well, including an oyster house, the 19th-century equivalent of a fast-food place. Samuel did well in life as well as work: his marriage produced 10 children who, by all accounts, were educated and industrious. His grandson, Garnet Baltimore, became the first black graduate of Rensselaer Polytechnic Institute (RPI) in Troy. He worked on bridges, railroads, canals and waterways all over the state, including the difficult “mud lock” on the Oswego Canal, where he developed a system to test cement that was adopted as standard by the state of New York. In the photo album assembled by Emma Baltimore is a photograph of a lovely young lady identified as “Cousin Ann Myers.” Paul Stewart of the Underground Railroad History Project of the Capital Region identifies Ann as a granddaughter of Stephen and Harriet Myers, whose home on Albany’s Livingston Avenue was a stop on the Underground Railroad. The couple also published an abolitionist newspaper in the late 1840s. Ann had a sister, Elizabeth, married to Stanislaus Kostka Govern, manager of the Cuban Giants baseball team and sometime Shakespearian actor. His photograph is also in the photo album. Emma Baltimore, who assembled it, was Samuel’s granddaughter, daughter of his son George H. Baltimore of Whitehall, where she met and wed John Henry. They had five children, only two of whom survived childhood, and those two suffered from spinal bifida. Their daughter Bella is described as a hunchback, and her sister was Georgiana. Despite her ailment, Bella proved to be as industrious as the rest of the Henry and Baltimore family. She was a ribbon-wearing member of the Methodist Church’s Epworth Society. By 1890 she was shipping her homemade candies as far away as Seattle. In 1894, she penned a moving obituary to her surviving sister that was published in the newspaper. John and Emma’s family enjoyed an active social life centering on the Methodist Church. But like most small-town black families in the North, their world was much wider. A handsomely coifed Walter N. Cosburn is found in the album, his photograph taken in Worcester, Mass. Remembered for strenuously objecting to a bill calling for raising an army of “colored men” that placed them under white officers, he made an unsuccessful run for the Worcester city council. Such high-achieving persons of their race were valued as friends, however far off they lived, by established black families like the Baltimores and Henrys. Historical treasures can ask more questions than they answer. Among the mysteries of the Baltimore photo album is the identity of Matilda Henry. Described in the diaries and obituaries as being a daughter of John and Emma Henry, she shows no similarity to either and, unlike the other Henry children, no childhood photographs of her are in the album. Matilda (or “Mati” as she was commonly called) appears in later censuses, described as a vocalist and music teacher, but not living with the Henry family. Further research can create an even richer picture of a dynamic and successful African-American family in northern New York.